How does a knife cut things at the atomic level? As the title says. It is common sense that sharp things cut, but how do they work at the atomical level? For organic matter, such as bread and human skin, cutting is a straightforward process because cells/tissues/proteins/etc can be broken apart with relatively little energy. This is because organic matter is much more flexible and the molecules bind through weak intermolecular interactions such as hydrogen bonding and van der Waals forces. For inorganic matter, however, it's much more complicated. I collaborate with a group who perform nanoindentation experiments on ceramics which involves forcing a nanoscopic tip into a material - essentially equivalent to cutting it with a knife. I've probed them on what's actually happening at the atomic level during these experiments and what 'hardness' means in this context, but they simply don't know. In each case the blade penetrates the right side of the block and is dragged to the left. You can see the atoms amorphise in the immediate vicinity due to the high pressure and then deform around the blade. This is a basic answer to your question. That blue ring that travels through the bulk along [10-1] is a dislocation loop. If these dislocations encounter a grain boundary then it takes more energy to move them which makes the material harder. For this reason, many materials (such as metals, which are soft) are intentionally manufactured to be grainy. What's really interesting about it is that, initially, crystal twins form (visible in Stage 1) in order to dissipate the energy. This involves layers of the crystal changing their orientation to accommodate the strain. In short: it's complicated but very interesting! It depends on what's being cut. When metal is cut, what happens is that, on a small or not so small scale, it shears. That means layers slide over each other. The mechanism by which they slide over each other is that there are imperfections in the crystal structure called dislocations, and the crystal layers can move by making the dislocations move in the other direction. You can visualize this with a zipper on a jacket. Suppose the zipper is all zipped up, except for a little bulge where N teeth on one side and N+1 teeth on the other side are not locked together, and suppose this bulge can be moved, by locking teeth together at one end while separating them at the other end. If the bulge is allowed to travel the entire length of the zipper, then teeth that were originally locked together are now locked with the neighboring tooth. That's how layers in a crystal can slide over each other - by the little bulges traveling fast in the other direction. 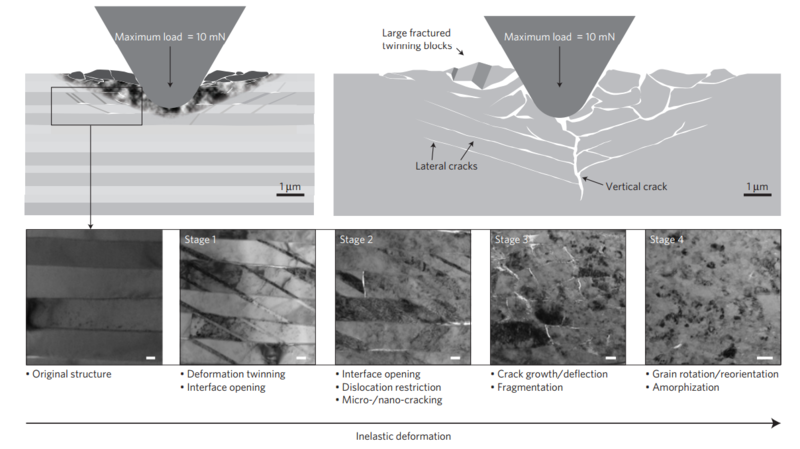 A way to make a metal (or any crystalline material) hard, and thus resistant to cutting, is to arrange it so it either has no dislocations, or the dislocations it has are "pinned" so they cannot move. A sharp knife is still several molecules thick on the edge; dull blades are even wider. So when you attempt to cut material, it needs to be ripped apart. As explained in other answers, the material either fractures along faults in the lattice, or you separate molecules (as when you cut bread). The only materials where you might split chemical bonds are vulcanized rubber and polymers. In theory, a mining truck tire is one molecule. Not the answer you're looking for? Browse other questions tagged solid-state-physics material-science atoms molecules molecular-dynamics or ask your own question. What happens when we cut objects? What happens to the electrons when metal gets cut or broken? Why does sawing action increase the effectiveness of cutting knives? What are the conditions for puncturing? Have we ever seen an atom? If not, how do we know they exists? How to measure the atomic radius of a noble gas? If we cut an object in half and touch the two halves together, why do the bonds not reform automatically? do gravity shows its effect in atomic level? What is the difference between Fermi level and Fermi edge? How does glue work on the atomic level? Does the Fermi level depend on temperature? Why does paper cut through things so well?